More than two thousand villagers broke through a cordon composed of police and gangsters, and marched to the site of the December 6, 2005 Shanwei Massacre to once again demonstrate to protect their land rights. During the Shanwei Massacre, police shot and killed as many as 70 citizens who were demonstrating against the illegal seizure of their land by government officials and commercial developers who seized private land to build a power plant in Dongzhou Village, Shanwei City, Guangdong Province. One villager at the scene told The Epoch Times that hired gangs are standing guard at every street crossing to monitor villagers' activities. And under the protection of several hundred mobsters, the construction of the transmission tower project continued that day. Before the villagers arrived at the site, the mobsters started throwing stones at the villagers. After one stone hit a woman's foot, both sides started throwing stones at each other. During the fight, a number of villagers were injured. One mobster was seriously injured in the chaos and then they all retreated. Two mobsters' motorcycles were burned by the angry villagers. 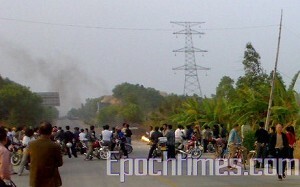 The protesting villagers left the scene in the evening. Two large police buses were present at the time, but the police did not attempt to stop the confrontation. The villager also revealed that the mobsters wore white gloves, carried a Duke Guan knife, sickles and clubs, wore safety helmets, and provoked the villagers. After finding out that a large number of villagers were arriving, they dispersed in all directions. According to an official who is not willing to disclose his name, on that day, 30 vehicles were dispatched to monitor villager's whereabouts, 20 of them were large vehicles. 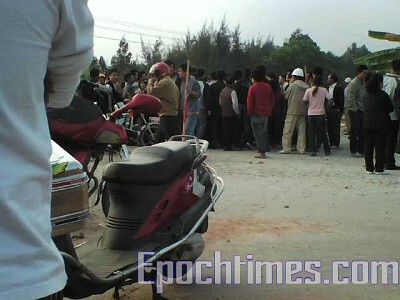 Villagers confronting the hired gang to get to the construction site to protest their land seizures in Shanwei. According to the villagers, the Shanwei Power Plant Company has broken many regulations, including those set by the State Council, to illegally expropriate over 2,000 acres of farm land and over 5,000 acres of costal beach. And project also damaged over a hundred square kilometers in the gulf that was rich in fish and shrimp production. The resources of farmland and fishing ecology were totally destroyed. Not only was a reasonable, lawful compensation continually rejected over a long period of time, but the authorities have unceasingly suppressed farmers' legal protests. The construction site of the 500KV transmission tower is located at the crossroads where the “Shanwei Massacre” took place, and currently, all but one transmission tower is unfinished. The Shanwei authority has failed to pay the land compensation and the villagers want to stop the construction of the power station to protect their legal rights.